At the Artist’s Play Room this week the theme is colour combinations. I chose purple and yellow – purplow. Actually this is a continuation of last week’s theme. 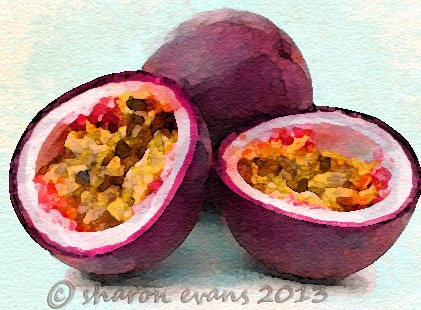 I was going to do passion fruit as it is my favourite fruit, but I got bogged down in problems. It was hard to get the yellows right without looking muddy! I had several attempts. See below. This one I felt I had got the whole passion fruit too smooth, wee...ll, it doesn’t look right to me, and the half the yellow is very muddy. . I know I am being a perfectionist! Actually it looks better here than in real life? This one is actually my favourite out of all the attempts, it has a more natural feel to it and slightly abstract. 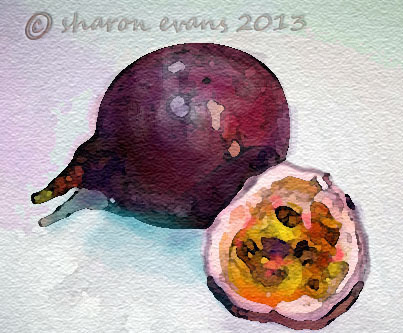 If like me you love passion fruit and fruit in general, go to and see what my digital playtime with some photos of passion fruit, figs and grapes from my garden, here. I tell you one thing, out of the 12 passion fruits I harvested last week I have only one left, and that probably won’t last the day! Happy APR and Jen if you are reading these posts, get well, look after yourself and you are in my prayers. 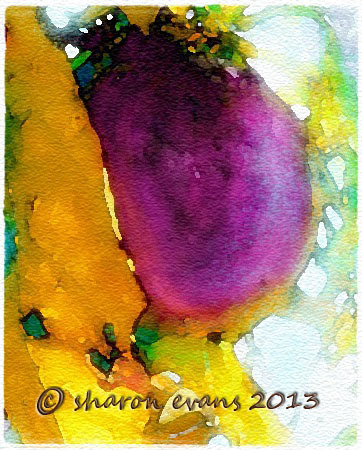 Yellow and purple make a lovely combination, very juicy colours, not at all muddy...I like your abstract one best.. fab!! it is easy to make mud with yellow and purple but your paintings were a success. i especially like the last one. I agree, it has an abstract quality. thank you for visiting and commenting on my blog. hope to see you again. Absolutely beautiful!!! :D Lovely work! love the last one! Your purplow fruit painting is beautiful, and the abstract is so rich and gorgeous. I just looked at hour link to your fruit garden. How wonderful to have those lovely fruits growing just outside the back door - as a fruit lover it would be heaven for me. And your paintings are just a wonderfyl riot of colour and design. I hereby crown you the Queen of Colour. Purplow passion fruit... oh YUM! I actually dreamt about passion fruit last night... weird as it is... we had some growing on our fence in South Africa when I was very young, and of course I thought everyone in the world had them growing on their fences. Great was my dismay when we moved and the new fence lacked passion fruit:-( It has been decades since I've had one, so yours delight my eyes and make me drool! these are wonderful! the top one is especially breathtaking. The colors are vibrant and beautiful! A beautiful piece of artwork Sharon...that makes the mouth water. The colours are spectacular! The purple and yellow together is so pretty. I like the 3rd one best. wow, these are stunning Sharon - the colour combo is beautiful - who knew! What a great color combo. I'm really struck by that last photo.